661-05-0001 - Skunk2 Head Studs - Pann Auto Performance - San Diego largest aftermarket automotive performance parts - What do you drive? Skunk2 Pro Series Head Studs for the B16, B17, B18, K20, and K24 VTEC engines are manufactured from a premium grade 8740 chromoly steel that yields a tensile strength of 190,000 PSI! Pro Series Head Studs are cold-forged for the best material strength, heat treated, and then thread rolled; increasing the stud and threads strength and fatigue resistance. Skunk2 Pro Series Head Studs also feature a straight pointed section at one end, that is reduced in diameter, just below the first threads that allow the studs to completely bottom out in the block and pre-load the fastener in the block. 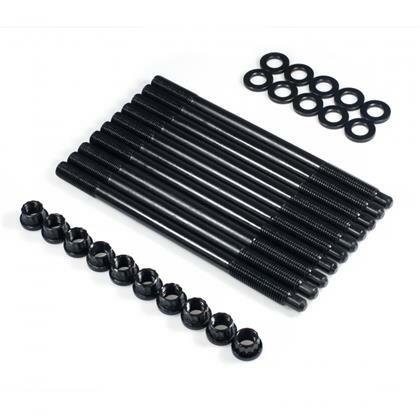 The hardware in these head stud kits include forged 12-point nuts and hardened parallel ground washers that even load distribution for accurate torque readings.